℗ 1995 The All Blacks B.V.
© 1995 The All Blacks B.V.
"Hellfire" contains elements from Apotheosis - "Obumbratta", Sam The Sham And The Pharaohs - "Wooly Bully" and The Crazy World Of Arthur Brown - "Fire". "Name Of The DJ" uses female vocals taken from Roxanne Shanté - "Big Mama" and male vocals from Public Enemy - "Terminator X To The Edge Of Panic". One of the better Mokum releases for sure. Not too commercial and ravey, and not so industrial it's unlistenable. Love Me Bad is actually a bit less imaginative than the other tracks, the formula of beats and helium vocals pretty tired even by 1995. Name of The DJ is very well known and deservedly receives its acclaim. 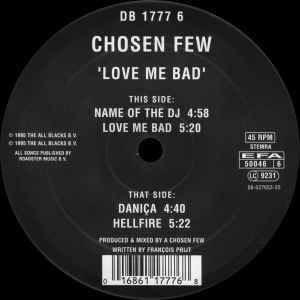 For me though Daniça is the highlight and the peak for Chosen Few releases around this time. Simple, hard, pitch bending and filtering over a wickedly mean bassline. Clean yet nasty! Just how gabber should be. "Name of the DJ" has become a huge underground hit, primarily due to the alternating bassdrum. According to Mokum website Francois himself argues that the "Name of the DJ" is the best Mokum track ever! The sample "At the count of three I want you all to tell me the name of my DJ, one two three" comes from "terminator X to the edge of panic" from the legendary Public Enemy album "It takes a nation of millions to hold us back".